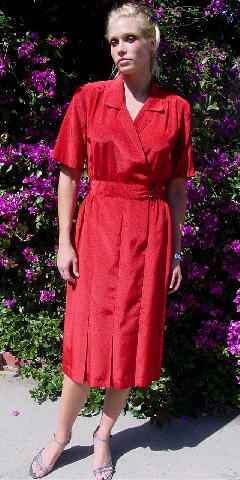 This 100% polyester red background dress has a black leaf design pattern and is by Diane Von Furstenberg. It has short sleeves, shoulder pads, and a crossover front bodice which has 2 interior buttons and 3 black exterior buttons. 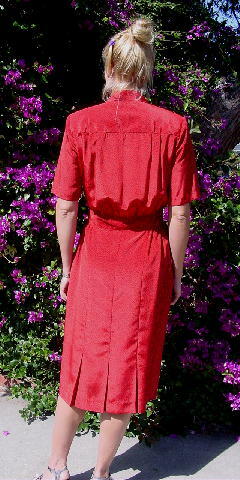 The lower skirt has 2 wide bottom pleats in the front and 3 in the back. It was worn once, in a foreign film. shoulder pad to shoulder pad 17 1/4"
shoulder to end of sleeve 11 1/2"
shoulder to hem 45 1/4"